Cheque Truncation is settlement of clearing transactions on the basis of images and electronic data without the physical movement of the instruments. The Clearing Cheque is truncated at the presenting bank itself. Cheque Truncation System is also known as Image-Based Clearing System (ICS). In India, this project is undertaken by the Reserve Bank of India, for faster clearing of cheques. Cheque truncation, would eliminate the need to move the physical instruments across branches, except in exceptional circumstances. This would result in effective reduction in the time required for payment of cheques, the associated cost of transit and delays in processing, etc., which speeds up the process of collection or realization of cheques. Truncation is the process of stopping the flow of the physical cheque issued by a drawer to the drawee branch. The physical instrument will be truncated at some point en-route to the drawee branch and an electronic image of the cheque would be sent to the drawee branch along with the relevant information like the MICR fields, date ofpresentation, presenting banks etc. In addition to operational efficiency, Cheque Truncation has several benefits to the banks and customers which includes introduction of new products, re-engineering the total receipts and payments mechanism of the customers, human resource rationalization, cost effectiveness etc., Cheque Truncation thus is an important efficiency enhancement initiative in the Payments Systems area, undertaken by RBI. RBI is proposing to implement the project on a PILOT basis in the National Capital Region (NCR), New Delhi. Based on the experienced gathered, it would consider extending the coverage to other centres.In the process of implementation, banks have been given the freedom to decide the point of truncation. RBI would be installing an interface with its system (CHI) at the service branches of banks, who are members of New-Delhi Bankers Clearing House. Banks have to decide the point of truncation and have to ensure that the images are digitally signed after their capture. It would flow thereafter to the interface (CHI) provided by RBI, from where the images would flow to the clearing House with the digital signatures of the banks. These digitally signed images would reach the service branches of the drawee branches clearing house interface. The service branches have to ensure that these images are moved across their branches to ensure their processing. RBIís services include system development and installation at the clearing house, interfaces at the banksí end, network, handholding, awareness propagation and training. The CTS project envisages a safe, secured, faster and effective system for clearing of the cheques. In the CTS the presenting bank will capture the data & images of the cheques using their Capture System which is internal to them. They have to meet the4 specifications and standards prescribed for data and images. To ensure security, safety and non-repudiation the PKI (Public Key Infrastructure) is being implemented across the system. The banks will send the captured images and data to the central clearing house for onward transmission to the payee/drawee banks. For that purpose RBI will be providing the banks software called the Clearing House Interface (CHI) that will enable them to connect and transmit data in a secure way and with non-repudiation to the Clearing House (CH). The Clearing House will process the data and arrive at the settlement figure for the banks and send the required data to payee/drawee banks for processing at their end. The drawee/payee banks will use the same CHI mentioned earlier for receiving the data and images from the Clearing House. It will be the responsibility of the drawee bank Capture System to process the inward data and images and generate the return file for unpaid instruments. i. Membership of the clearing house in the NCR. (b) Such banks may use the infrastructure of the other banks having INFINET membership without being the INFINET members themselves and there clearing settlement can be done either directly or through the member through whom they are participating. The infrastructure required for CTS from bankís end are connectivity from the bank gateway to the clearing house, hardware and software for the CTS applications. RBI shall be providing member banks with the CHI and the banks have to procure other hardware and system software for the CHI and the application software for their capture systems on their own. The hardware requirement is based on the volume of the cheques processed by the banks. Based on the volume the CHI is categorized into four types and the hardware requirement is different for each category. The band width requirement for each bank is calculated based a number of factors like the peak inward and outward volume of the bank, average size of an image, efficiency factor of the network etc. In addition to that future requirement have been taken into consideration for calculating the band with requirement. Imaging of cheques can be based on various technology options. The cheque images can be black and white, Grey Scale or coloured. Black and White images do not reveal all the subtle features that are there in the cheques. Coloured Images increase storage and network bandwidth requirements. So it was decided that the electronic images of truncated cheques will be in gray scale technology. There will be three images of the cheques i.e. front grey, front black & white and back black & white which will be made available to member banks. The image quality of the Grey Scale image shall be 8 bits/pixel (256 levels). 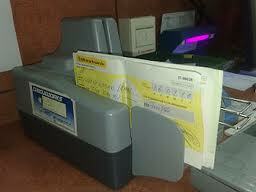 Images of cheques are taken using scanners. Scanners also function like photo-copiers by reflecting the light passed through narrow passage on to the document. Tiny sensors measure the reflection from each point along the strip of light. Reflectance measurements of each dot is called pixel. Images are classified as black and white, gray-scale or colour based on hoe the pixels are converted into digital values. For getting a gray scale image the pixels are mapped onto a range of gray shades between black and white. The entire image of the original document gets mapped as some shade of gray, lighter or darker, depending on the colour of the source. In the case of black and white images, such mapping is made only to two colours based on the range of values of contrasts. A black and white image is also called a binary image. The security, integrity, non-repudiation and authenticity of the data and image transmitted from the paying bank to payee bank will be ensured using the Public Key Infrastructure (PKI). The CTS is compliant to the requirement of the IT Act, 2000. It has been made mandatory for the presenting bank to sign the image & data from the point of origin itself. The image and data are secured using the PKI through out the entire cycle covering capture system, the presenting bank, the clearing house and the drawee bank. The PKI standards used are in accordance with the appropriate Indian acts and practices of IDRBT which is the certifying authority for banks & financial institutions in India. CTS also supports the intercity clearing and specialized clearing like high value clearing etc. The on-us instruments where both presenting and drawee banks are same are not allowed in the CTS. Images of such instruments would be stopped at the Clearing HouseInterface itself. Bank customers should use image friendly cheques. They should preferably use dark coloured ink while drawing the instruments. Care should be exercised in the use of rubber stamp, so that it would not interfere with the material portions of the cheque. The date of the cheque, payees name, amount and signature are the basic features which are essential in a cheque. The use of rubber stamps, etc, should not overshadow the clear appearance of these basic features in image. In order to ensure that all essential elements of a cheque are captured in an image during the scanning process, bank customers have to exercise appropriate care in this regard. There will be no change in the clearing process. Customers would continue to use cheques as at present, except in the use of image friendly coloured ink for making the instruments. Of course, such of those customers, who used to receive the paid instruments, like Government Departments, would only receive cheque images instead of the physical instruments. This will also facilitate in better processing at their end, as they will be able to access online images in addition to the data. As the images are going to be moved across, the time taken for the receipt of paid instruments at their end could be reduced so that better and timely control could be exercised over payments. This will also give an early opportunity to the drawers or issuers of cheques to detect frauds or alterations in their cheques. It is also possible for cheque issuers to consider newer techniques such as embedded verifiable features such as bar-codes or logos or watermarks, encrypted codes, holograms, etc., which would facilitate early interception of altered/forged instruments. Under CTS, after the capture of the image, the physical cheque would be warehoused with the presenting bank. In case the beneficiary or any other connected persons require the instrument, the payee bank could issue a copy of the image, under its authentication, which is called Image Replacement document. It is a legally recognized replacement of the original cheque for re-presentment. The provisions of NI act (Section 81(3) of the NI Act as amended) also permit the usage of such IRD. The General Manager, National Clearing Cell, Reserve Bank of India, 7th Floor, Tower 1, Jeevan Bharati Building, Connaught Place, New Delhi – 110 001. 0 Response to "Cheque Truncation system (CTS) in Banks"